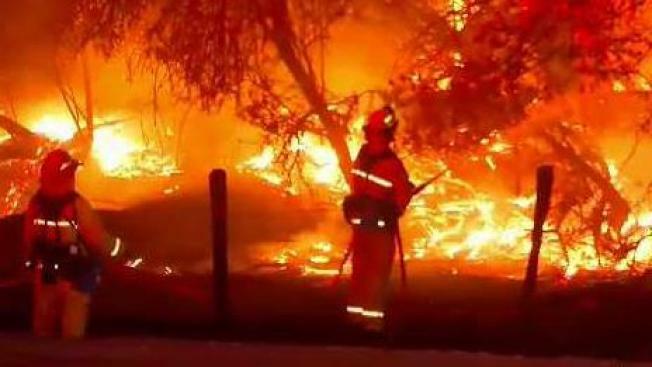 At Least 9 Dead as Fast-Moving Blaze Rages Through Northern Calif. Authorities say nine people have been confirmed dead in the raging Camp Fire in Northern California, which now has become the state's most destructive wildfire. Cheryl Hurd reports. Authorities say nine people have been confirmed dead in the raging Camp Fire in Northern California, which has become the state's most destructive wildfire. Butte County Sheriff Korey Honea said Friday that some people were found inside their cars and others were found outside vehicles. He says he doesn’t have all the details on the circumstances of the deaths. The wildfire burning in the town of Paradise late Friday had charred at least 100,000 acres and is 20 percent contained, Cal Fire officials said. At least 52,000 people have been evacuated. In addition, Cal Fire reported more than 6,400 residential structures have been destroyed and 260 commercial structures are lost. Paradise is 180 miles northeast of San Francisco. All of the city's 27,000 residents were ordered to evacuate on Thursday as the wildfire quickly turned into an inferno, setting off a desperate exodus in which many motorists got stuck in gridlocked traffic and abandoned their vehicles to flee on foot. People reported seeing much of the community go up in flames, including homes, supermarkets, businesses, restaurants, schools and a retirement center. "Pretty much the community of Paradise is destroyed. It's that kind of devastation," said Capt. Scott McLean of the California Department of Forestry and Fire Protection. Heavy smoke from the fire prompted the Bay Area Air Quality Management District to issue an air quality advisory and a Spare the Air alert for Friday. The agency’s advice: "If the smell of smoke is present, it is important that Bay Area residents protect their health by avoiding exposure. If possible, stay inside with windows and doors closed until smoke levels subside." Meanwhile, Pacific Gas & Electric Co. said it experienced a problem on an electrical transmission line near the site of the massive fire before it exploded in size. The company said in a one-paragraph summary filed Thursday with state utility regulators that it had experienced an outage on the line about 15 minutes before the fire started. The company said it later observed damage to a transmission tower on the line near Paradise. Those looking for loved ones can check with safeandwell.org or contact the Sheriff's Office at 530-538-7322 to request a welfare check or file a missing person report.